TRANSMISSIONS: Longer life due to premium integrated zero-turn transmissions featuring charge-pumps, larger drive axles and expansion tanks. Longer life due to premium integrated zero-turn transmissions featuring charge-pumps, larger drive axles and expansion tanks. 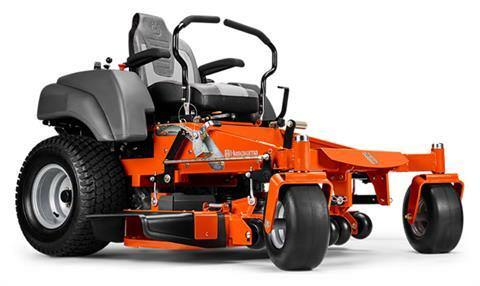 EASY-ACCESS SERVICE POINTS: Oil and filter maintenance, hydraulic drive system components/adjustment, electrical system and battery are all within easy reach so you can quickly get back to being productive. Oil and filter maintenance, hydraulic drive system components/adjustment, electrical system and battery are all within easy reach so you can quickly get back to being productive. COMFORT & SUPPORT: The comfortable high back seat features standard arm rests. The comfortable high back seat features standard arm rests. Wheels/Tires Front - 6.5 x 6 - 13 in. Mowing Height Range Approximate - 1.5 - 4.5 in.